Perform these procedures after the engine has cooled down. (a) Remove the air filter. (b) Check that the air cleaner is not excessively dirty. If the air cleaner is excessively dirty, replace the air cleaner filter element. 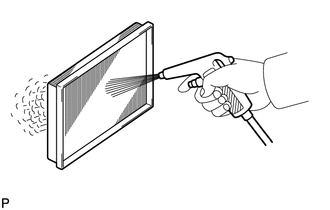 (c) If cleaning the air cleaner filter element, blow compressed air as shown in the illustration to clean it. (d) Reinstall the air filter. (a) Visually check the pipes, hangers and connections for severe corrosion, leaks or damage. (a) Visually check the fuel lines and hoses for cracks, leaks, loose connections or deformation. (b) Check for tank band looseness or deformation.